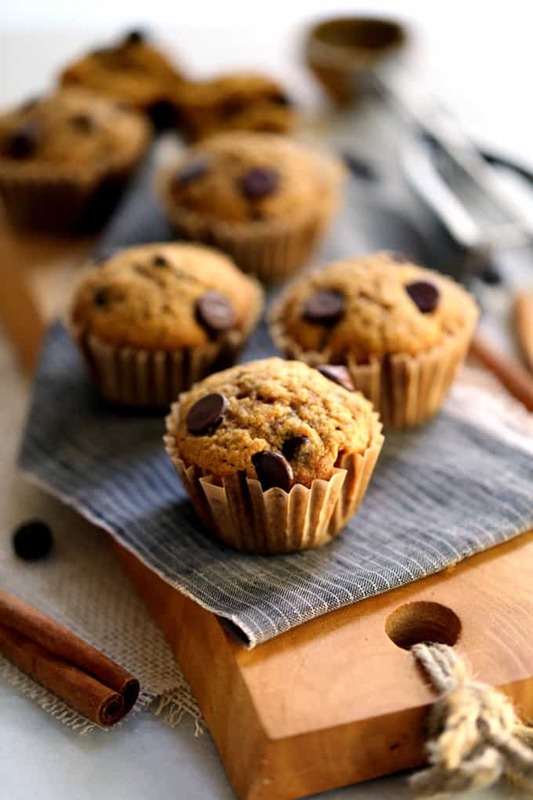 Pumpkin Chocolate Chip Muffins worthy of any autumn occasion, this batter takes just 10 minutes to prepare and is spiked with cinnamon, cloves and allspice before being studded with a generous amount of dark chocolate chips. At our house, you know it’s fall when the first dozen Pumpkin Chocolate Chip Muffins come out of the oven. 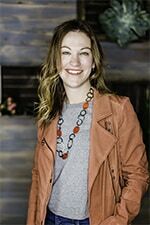 The wafting scents of cloves and allspice signals that the weather is becoming more cool and it’s time to start wearing layers. Perfect for breakfast or an addition to a brunch buffet, you really can’t go wrong when these muffins are on the menu! They also make a great gift to give to your sister-in-law as a thank you for watching your three children so that you can have a date night with your husband. You know, in case that applies to your situation. This pumpkin batter takes just 10 minutes to prepare and is spiked with cinnamon, cloves and allspice before being studded with a generous amount of dark chocolate chips. 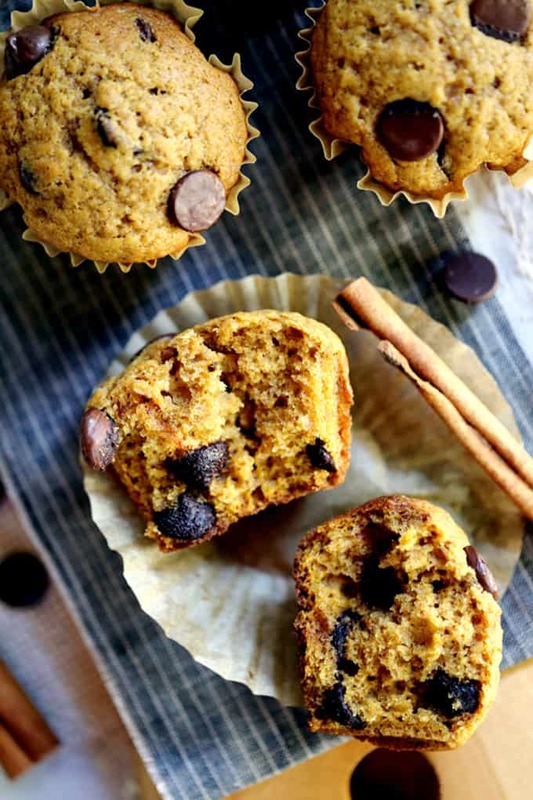 The end result is a Pumpkin Chocolate Chip Muffin worthy of any autumn occasion and perfect with a cup of coffee to begin your day. But really, who am I kidding? 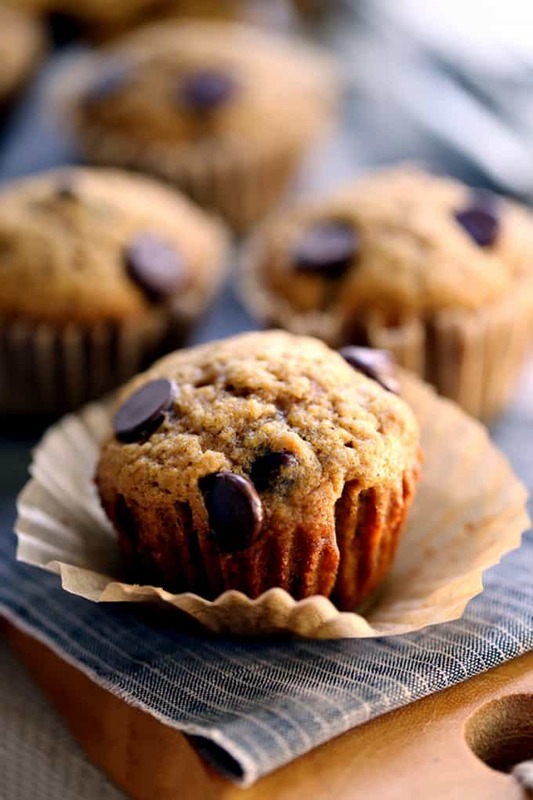 These muffins are heavenly any time of day and disappear quite quickly. This recipe yields three dozen muffins. Don’t even think about halving the recipe – extra muffins freeze well for a quick breakfast on a busy morning! This is why I’ve been known to double the recipe to insure that we have a large stockpile at the ready for any muffin emergencies that may arise. It seems I might have a pumpkin recipe for any time of day. I also have these Pumpkin Butterscotch Oatmeal Muffins that are breakfast and brunch ready. You could then follow them up with my Pumpkin Pasta with Sausage and Apples for dinner and and my Upside Down Pumpkin Pie for dessert. Talk about a delicious day! 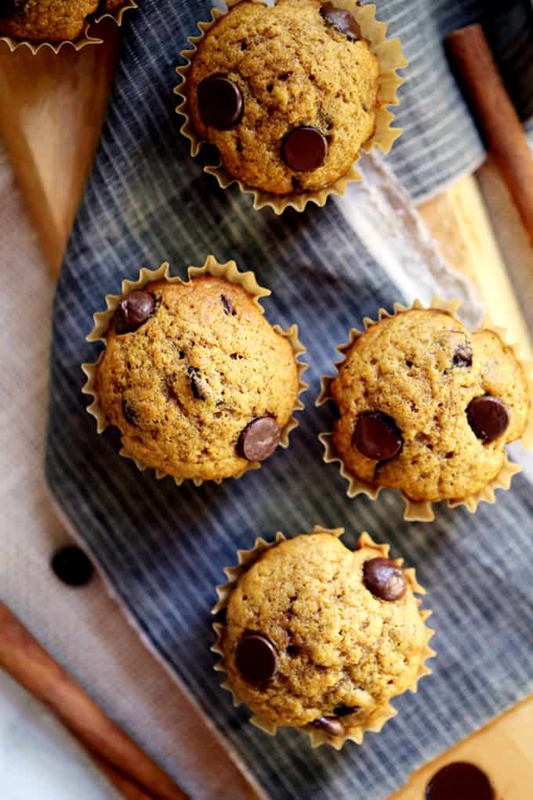 I use a store bought can of pumpkin puree for these Pumpkin Chocolate Chip Muffins but you definitely could make your own to elevate their deliciousness as well. This Homemade Pumpkin Puree recipe looks simple enough! You could also use it in this dessert mashup Pumpkin Zucchini Cake or these heavenly Pumpkin Scones. In the bowl of an electric mixer, lightly beat eggs. Stir in pumpkin and butter. Add flour, sugar, baking soda, cinnamon, cloves, allspice and salt and stir until just combined. Scoop batter into prepared muffin tin using a large cookie scoop . Bake for 20-25 minutes. Let rest in pan for 5 minutes and then transfer rack to cool. A huge thank you, Melanie! I made these and they're outstanding and this is a keeper recipe! My family loved them too. I made them in mousse rings and used 1/2 tsp baking soda and 1 tablespoon baking powder. The tops mounded beautifully. I also added vanilla, because I love it. Thanks so much again! Thanks so much for the compliment, Ali - love that your family seemed to enjoy it as much as mine does! Your recipes KILL ME! These look amazing! How much pumpkin puree shoulg be here? 115 oz? They look great and I'd like to bake these. Hi, Kabamaiga!You'll need one 15 oz. can of pumpkin for this recipe. Let me know what you think if you try them!